Now fans of aliens can have this E.T. 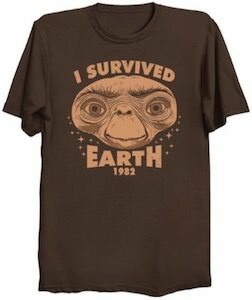 I Survived Earth T-Shirt. The t-shirt is all about the classic E.T. movie and is available in styles for men, women, and kids and comes in many colors and in sizes going up all the way to adults 6XL. On the t-shirt you can see the face of E.T. and around the face it says “I Survived Earth 1982”. And we all know that he made it home safely and that the movie is from 1982. It’s a cool t-shirt that will bring back memories to the classic movie and will make people think about rewatching this movie.